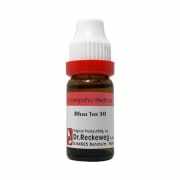 Rhus dilution is homeopathic remedy containing Rhus toxicodendron. It is also known as Rhus tox. Other names include Toxicodendron pubescens and Toxicodendron radicans. Rhus Toxicodendron is used for treating several conditions, including skin rashes, cramps, strains, sprains, restless leg syndrome, flu, viral infections, arthritis. This remedy has primarily been studied for its effectiveness as a treatment for arthritis pain. Research shows that its effectiveness against this kind of pain is questionable at best. Rhus toxicodendron is most commonly used for the alleviation of arthritis symptoms. It can be given to people with arthritis of any age, adult, or child. A licensed pharmacy from your nearest location will deliver Dr. Reckeweg Rhus Tox Dilution 30 CH. Once the pharmacy accepts your order, the details of the pharmacy will be shared with you. Acceptance of your order is based on the validity of your prescription and the availability of this medicine.